Weiss A/S will participate again in Save the Planet 2017. It is specialized in waste and biomass combustion solutions and has experience as a green profile company. Tell us more about your history. Weiss A/S has a long experience in building environmentally friendly and high performing combustion boilers. Since 1922, Weiss has specialized in tailor-made turn-key combustion plants. They convert various types of biomass or waste into: hot process water, district heating process. What is the development of the company through the years and what are the latest products and turn-key solutions you offer to your clients? 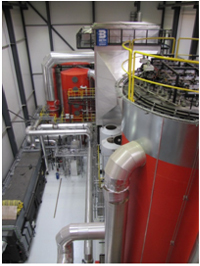 Weiss mainly focuses on projecting, designing, and installing combustion plants for bio fuels and waste. Our turn-key plants range from 1 MW to 30 MW in a single boiler line. We have delivered several Waste-to-energy plants burning waste wood and municipal waste in Norway while in Eastern Europe we are mostly sought for solutions for biomass combustion (i.e. burning residues from food production to deliver process steam). However, observing the latest developments in Germany concerning sludge being banned as a fertilizer in agriculture from the 1st of January (to protect environment and groundwater) - Weiss has developed a solution that can burn sludge in conjunction with other fuel sources. Weiss expects that the German ban against using sludge as fertilizer will spread across Europe and combustion plants that can burn e.g. food and industrial waste as well as sludge will be in high demand. Which of them will you present in Sofia? We would like to introduce our customers to solutions that are able to burn different fuels in the same oven. This optimizes the processing of waste for e.g. municipalities. The new oven from Weiss is developed upon traditional techniques, and this approach makes it possible to combine more solid fuel sources with sludge. Normally, sludge is burned in a fluid bed incinerator. We have developed the oven with a step grate that you would use for all other types of fuel and adjusted it to accommodate sludge as well. Municipalities can use the sludge for district heating or power. A company that produces sludge can also burn it to create process steam. Could you please tell us about your recently realized projects in South Eastern Europe and in Bulgaria in particular? Weiss has 7 boiler installations in service at 4 different locations in Bulgaria. Mostly we replace gas boilers with ours that can burn straw or wood chips. All installations are steam boilers that produce saturated or superheated steam for production processes within food or alcohol production. We are currently working on new possibilities also including Waste-to-energy plants. Who do you want to invite to visit your stand? We would like to invite visitors that are interested in improving their production processes, recovering energy from resources they already have. Our solutions are very popular among food producers or district heating providers. However, like mentioned before, we are also experts in providing waste combustion installations. Observing the trends in reducing landfills and recycling - these are also becoming very popular in South Eastern Europe, sought by local communities as a simple solution to reduce municipal waste or RDF.